Hanuman came to be regarded as an avatar of Shiva by the 10th century. Hanuman is mentioned as an avatar of Shiva or Rudra in the Sanskrit texts like Mahabhagvata Purana, Skanda Purana, Brhaddharma Purana and Mahanataka among others. This development might have been a result of the Shavite attempts to insert their ishta devata in the Vaishnavite texts, which were gaining popularity. The 17th century Odia work Rasavinoda by Divakrsnadasa goes on to mention that the three gods – Brahma, Vishnu and Shiva – combined to take to the form of Hanuman. Hanuman became more important in the medieval period, and came to be portrayed as the ideal devotee of Rama. His characterization as a lifelong brahmachari was another important development during this period. The belief that Hanuman's celibacy is the source of his strength became popular among the wrestlers in India. The celibacy or brahmacharya aspect of Hanuman is not mentioned in the original Ramayana. In Jain texts, Hanuman is depicted as the 17th of 24 Kamadevas, the one who is ultimately handsome. 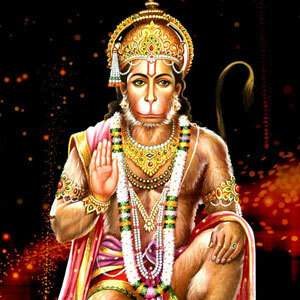 * Sri Hanuman Jayanti (Chaitra Shukla Chaturdashi and Purnima). * Ashwin Shukla Chaturdashi and Purnima. * Bhadrapad Shukla Chaturdashi and Purnima. Meeting with Rama Hanuman meets Rama during the Rama's 14-year exile. With his brother Lakshmana, Rama is searching for his wife Sita who had been abducted by Ravana. Their search brings them to the vicinity of the mountain Rishyamukha, where Sugriva, along with his followers and friends, are in hiding from his older brother Vali. In their search for Sita, a group of Vanaras reaches the southern seashore. Upon encountering the vast ocean, every vanara begins to lament his inability to jump across the water. Hanuman too is saddened at the possible failure of his mission, until the other vanaras and the wise bear Jambavantha begin to extol his virtues. Hanuman then recollects his own powers, enlarges his body, and flies across the ocean. On his way, he encounters a mountain that rises from the sea, proclaims that it owed his father a debt, and asks him to rest a while before proceeding. Not wanting to waste any time, Hanuman thanks the mountain, touches it briefly, and presses on. He then encounters a goddess disguised as a sea-monster, Surasa, who challenges him to enter her mouth. When Hanuman outwits her, she admits that her challenge was merely a test of his courage. After killing Simhika, a rakshasi, he reaches Lanka.